New general purpose both side open 20 ft sea containers are an affordable and clever cargo and storage solution for odd shaped items that may need side passage, or for stacking items with a forklift. 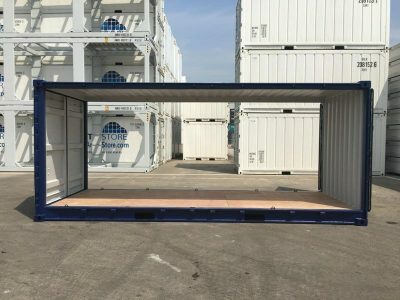 These open side shipping containers have bi-fold doors on both sides, opening 6 metre wide and enabling speedy placement and removal of goods. Made with corten steel, the containers are sturdy, weatherproof, vermin-proof, dry, secure, and long-lasting.